April and the TMNT bid farewell to Man Ray as they board a train that will carry them back to New York City. The heroes arrive safely back in the sewers and as they head for their lair, they hear music. The guys decide to track the tunes and discover that they’re coming from Shredder’s abandoned headquarters. 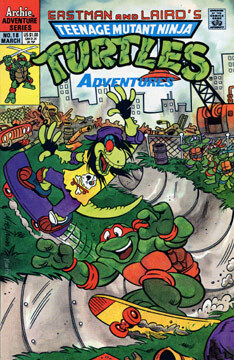 The Turtles wonder what’s up, since Saki is in prison, and they investigate the source of the music. Soon enough the TMNT discover that a local Metal band has set up a practice space in the warehouse. The lead guitarist begins some histrionics that cause a fuse to blow and the room falls into darkness. The TMNT hear something entering the room, and when the lights come back on, they see that the Metalheads have been surrounded by robotic Foot Soldiers! April and the TMNT spring into action as the Foot assault the group. The band’s leader, Mondo, is punched and sent flying into a stockpile of barrels – filled with Mutagen! Mondo has a pet gecko on his shoulder, so the Mutagen begins to morph him into a gecko-man. The battle with the Foot coninues. A Super Soldier has grabbed Mondo’s girlfriend and carries her off to a rooftop, with Mikey and Mondo in hot pursuit on skateboards. Mondo uses his thrashing abilities to knock the Foot off of the roof and saves his girl, Candace. Unfortunately for the mutant Metalhead, Candy tells him that she doesn’t think she can deal with his new appearance, and the two split up. The TMNT arrive and assure Mondo that he’s welcome to stay with them. Donatello notices a bunch of meteors zooming around a building that bears a familiar logo. The guys note the weird phenomena and then head back to the sewers, where they find Master Splinter and some fresh pizzas.